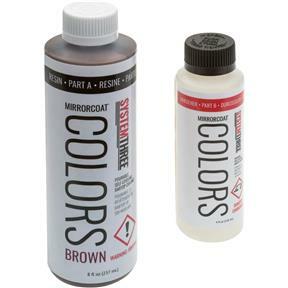 System Three 0512K38 - Mirror Coat Brown Kit, 12 oz. Mirror Coat Color Kits are 100% solids, pourable, self leveling epoxy resins, which form a tough, waterproof protective layer. Mirror Coat Colors come in white, black, brown, red, yellow, blue, and green. Colors can be intermixed to attain distinctive hues. Suitable substrates are wood, ceramic, stone, concrete, and properly prepped metal surfaces. Mirror Coat Colors are great for: woodworking projects, arts and crafts, and Mirror Coat enhancements.